ontolawgy™ – connect the dots™: Brace yourself for "dense reading of the most tortuous kind"
Brace yourself for "dense reading of the most tortuous kind"
Well, not here, I hope, but I thought I should warn you about it. With reports coming in that the House may pass the Senate health care bill with a simple majority and move it to reconciliation in the Senate for a simple majority vote, it seems that meaningful debate on the big issues is essentially over (though the partisan sniping shows no signs of letting up); there may be a few minor tweaks here and there, and some issues may be carved out and addressed separately. If the bill is going to survive in roughly the same form in which the Senate passed it (i.e., likely its best hope for survival), then it is going to present a number of challenges to those who want to understand and implement it, as suggested in a previous post. "Surely," you might think, "this must be judicial hyperbole." I can assure with great confidence that it is not. 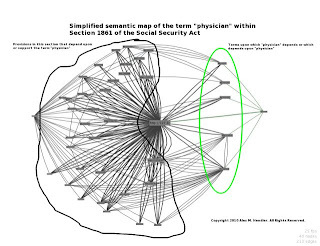 For example, below is a simplified (and rather incomplete) 1-degree semantic map of the term "physician" as it appears in Section 1861 of the Social Security Act, based upon analytical information available on the ontolawgy™ platform. By "1-degree", I mean that the map tracks only direct relationships among element within a system, i.e., A -> B and relationships that A and B share with other elements. On the right are the terms that require understanding of the term "physician" or that one must understand to understand the term "physician". On the left are the legal provisions—only within Section 1861—that are in some way related to the term "physician". Each of the lines in this diagram represents not only that a relationship exists between elements in the system, but also actually describes what the relationship is. Think of each line as a thought that a lawyer would need to have—consciously or not—in order to actually understand what a term or statutory provision means. In some instances, it may require 4 or 5 "thoughts" to fully understand the relationship among the elements. The ontolawgy™ platform tracks those thoughts and places them into a searchable database. If these diagrams don't look particularly helpful to navigate or understand the law, don't worry: They're not supposed to be (at least not when presented as static images). They are supposed to represent the complexity and interconnectedness of elements of the law and to demonstrate the difficulty that a mere mortal lawyer might encounter when researching Medicare and Medicaid issues. 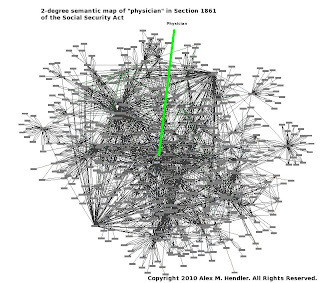 Now before you jump to any conclusions about the intellectual prowess of lawyers, remember that this diagram just relates to the term "physician" as used in Section 1861 of the Social Security Act. It does not address the term as it may appear in the other 108 sections of Title XVIII of the Social Security Act, nor does it address the term as it might be used in the context of Medicaid, nor in any of the millions of words (no exaggeration) of regulations, rules, Medicare and Medicaid manuals, and other statements of official policy. It may also help to bear in mind that Medicare and Medicaid regulate considerably more than just physicians. © 2010 Alex M. Hendler. All Rights Reserved. No claim to original government works.